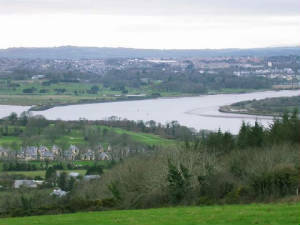 Habitat: Island and adjacent banks of River Suir, with mudflats, saltmarsh and woodland. 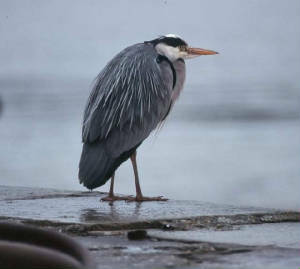 Main interest: Heronry; wintering waders & duck; resident passerines. Typical birds: Grey Heron (breeding), Little Egret, Wigeon, Greenshank, Common Sandpiper and commoner waders, Kingfisher, Jay. Scarcer species: Little Stint, Green Sandpiper. Access: The riverbank opposite the south-west shore of Little Island can be reached by taking the Dunmore East road near the Tower Hotel in Waterford City, and then taking a left turn after Waterford Regional Hospital at Ardkeen, just beyond Powerscourt housing estate. This leads to the slipway and ferrypoint (grid ref S639110). Alternatively, take a left at the first roundabout before the Hospital for a viewpoint (grid ref S636114) overlooking the west side of the island. 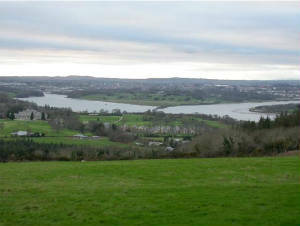 More distant views are possible of the southern tip of the island from several points further east along the main Dunmore road, and of the east side from the Coillte forest above Cheekpoint (viewpoint marked (P) on Discovery map, grid ref S676131). The river channels around the island can also be viewed from the Co Kilkenny side of the River Suir. The Island, over 170 hectares in extent, is downriver from Waterford City, and now boasts an exclusive hotel set in deciduous woodland, with a range of facilities for the wealthy visitor. One of the largest Heronries in County Waterford is on Little Island, and dozens of Grey Herons can sometimes be seen along the Suir between here and the City, usually with a few Little Egrets nowadays. There is a small but ornithologically important marshy area at the eastern tip of the Island which is home to several wader species from August on, mainly Curlew, Redshank and Greenshank, though Black-tailed & Bar-tailed Godwits have also been recorded. The river bank near the Island ferry can also be a good spot for Common Sandpiper, which probably winter here regularly, and the channel opposite is good for Cormorants. Red-breasted Mergansers are frequently seen on the Suir near the eastern end of the Island, and dozens of Teal and Wigeon winter. A few hundred Dunlin usually winter north or east of the island, along the Suir as far as Waterford port, along with up to several thousand Lapwing. With such extensive woodlands, Little Island is home to a range of passerine species, including Jays. The Island is also an important roosting area for thousands of Rooks and Jackdaws.